“In poverty, too, as in all other misfortunes, people think friends to be their only refuge…. 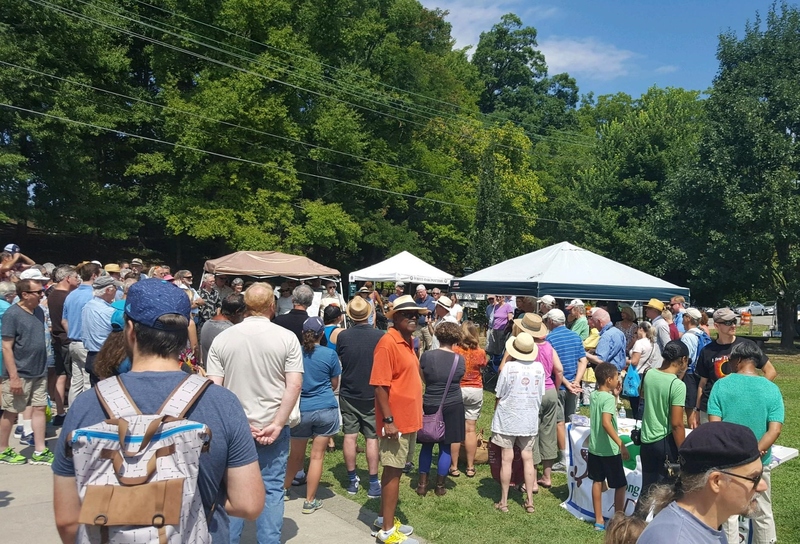 David McKnight at the Durham Farmer’s Market, Sept. 2014. David encountered many challenges in the years between being voted Most Likely to Succeed in high school and ending up living on the streets in Durham. All along the way, however, were friends who both were drawn to David because of his gifts and who he was, and who also nurtured those gifts and David. As a result, sometimes, together they brought about amazing events. A heads-up: this is a long post, but it all seemed essential to the final installment on friendship and David. Read it as you wish. I suggest a glass of your favorite beverage and finding a little time. Or just listen to the music, watch the videos, look at the pictures and browse around. Between 2009 and 2016, several things happened that substantially improved David’s life. 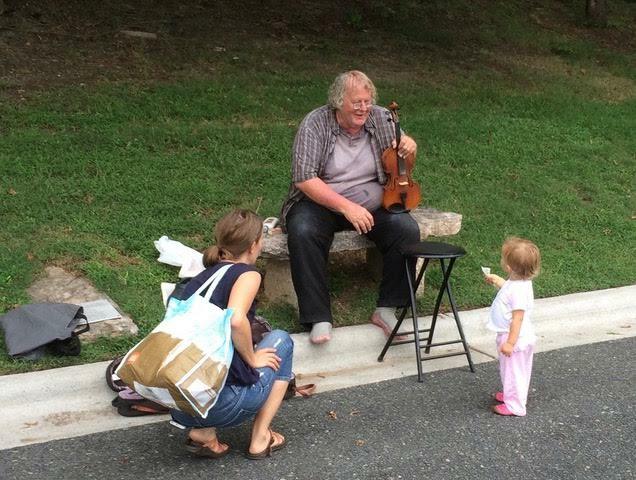 In 2009, he began playing his violin each Saturday at the Durham Farmer’s Market. The $100 he could make in tips became his main source of income and provided him more predictability about his resources after two decades of playing on the street. And the exposure to people who otherwise might never have heard or seen him brought joy to many, as witnessed by the mother and child with David above. And then, about 2013, a few years after David began playing at the Farmer’s Market, something remarkable happened. David accepted a long-standing invitation to share with a young man a two-bedroom side of a duplex only a couple of blocks from 9th Street and near the bus lines. David had held off accepting that invitation for a long while, but he turned 65 that year, and the results of aging, the lack of sleep, and his weight were taking a toll on him. The duplex was a god-send. It eliminated living on the street and thus ended David’s mind-boggling 20-year-long daily routine. In 2014, yet another good thing happened, thanks to friends who helped David to apply and qualify for Social Security benefits. This seemed an insoluble problem until Sybil had an idea. “Well, yes,” David responded with a quizzical smile. Amazingly, David laughed, and signed. From the album “Changin’ My Mind,” by Cleaver Smith Swenson & McKnight. Composed by David McKnight and John Wenberg. David McKnight – Guitar, Fiddle, Piano; Bill Cleaver – Guitar; David Spencer – Mandolin, Electric Guitar; Joe Swenson – Bass; Robert Smith – Harmonica; Bill Erchul – Pedal Steel Guitar; Time Rae – Percussion. 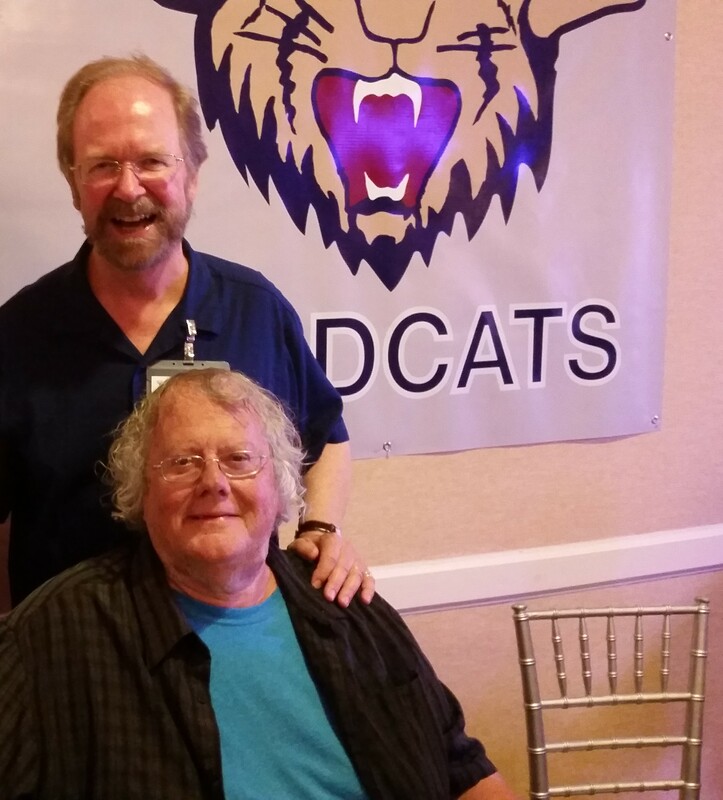 As if to cap off this good news, in 2016 David attended the 50th reunion in Charlotte of our Garinger High Class of ’66 in Charlotte. In the months leading up to our high school reunion in May of 2016, Sybil and I wrote David regularly, urging him to attend. He was very enthusiastic about the prospect, and he remembered our classmates far better than I did. 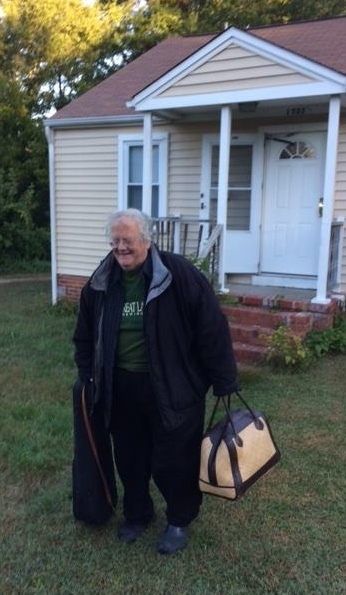 Bill Yaeger offered to David to take him to the Durham train station to buy tickets and to take him to buy a new pair of slacks and a shirt, which David had identified as items he needed for the reunion. All looked good. But at the last minute David became nervous and emailed Bill, saying that something had come up and he could not go with Bill to the train station. Nor to the store. I wrote David, and after a few days finally he wrote back with the time of the arrival of his train in Charlotte. We had no idea whether he would actually show up. My lifelong friend Ike Casey went with me to the Charlotte station, and when the passengers came through the tunnel to disembark, there was David at the end of the line, with a big smile, a bag, and the folding chair he carried with him everywhere for when he needed to take a rest break from walking. We stopped off at the Elizabeth Creamery and sat in the pleasantly warm sun on the quiet side street, enjoying a double-scoop waffle cone in the beautiful spring day. “This is the life,” he said with a smile. I heartily agreed. In fact, it was a wonderful day and weekend for me, too. The re-connecting with David and my other high school friends, and re-connecting David with them, was so very meaningful for me. And David now had a regular gig at the Farmer’s Market, an apartment, social security benefits, and a host of high school friends to add to his friends in Durham. This is the life. It seemed like the next day, but a few months later, it became obvious that something was wrong with David. His friends in Durham noticed that David had started forgetting words and had even more trouble walking. One day in November Bill Yaeger receive a call from David asking for help — the first time he’d ever asked Bill for help. Calling from the Duke library, David said, “I can’t move my body.” When Bill came to pick him up, David refused to go see a doctor. So Bill took him home, where he seemed somewhat better. The duplex was a mess: simply nothing was ever thrown away, and newpaper were piled up everywhere. Bill brought food to David for several days. But that follow-up visit never happened, for soon there was a time when no one saw David for days. Bill Yaeger was the first one to get to David’s duplex. He could tell David was in the bedroom, lying on the floor, with his considerable girth blocking the door. Bill was able to get the door open, and found David and the room in terrible condition. In addition to the usual newspapers and junk piled everywhere, David had lost control of his bowels and the room was putrid. When the ambulance and the EMS workers arrived, David protested that they had no right to take him from his home. Eventually they were able to get David into a chair and carried him in that chair to the ambulance. Bill rode in the ambulance with David to try to keep him as calm as possible. One of the EMS workers recognized David as the street musician and treated David as a celebrity, which improved David’s mood. Another stranger showing compassion and understanding for David. At the Duke hospital, the doctors put David on an anti-psychotic drug, one of the rare times in his life he took medicine for his mental challenges. Friends and family rallied around him, getting him into a good extended care facility only two miles from where David had played the violin on 9th Street all those years. He had visitors every day, including high school classmates Nancy Gaillard and Sybil Huskey, who came from miles away and stayed in town for days to be with David. Former band member Joe Swenson flew in from California. Carson, her daughters Meg and Lorrin and their families, Pete, and other family came to spend time with David. Even a policeman who knew David came and serenaded David with his guitar. Lorrin and Pete worked with the doctors and nursing home to get David the best treatment. Pete drove from Roanoke, Virginia, to Durham, and back again the same day to Roanoke, a two and one-half hour drive each way. Friend Bill Pope visited frequently, and Bill Yaeger spent time with David almost every day. It’s heart-breaking for friends and family to have such conversations with someone who is ill and in an institution. There was some solace for Carson: when family took David to Elmo’s Diner on his last birthday to have dinner with some of his friends, he announced to the table his deep appreciation of his sister and her importance to him. 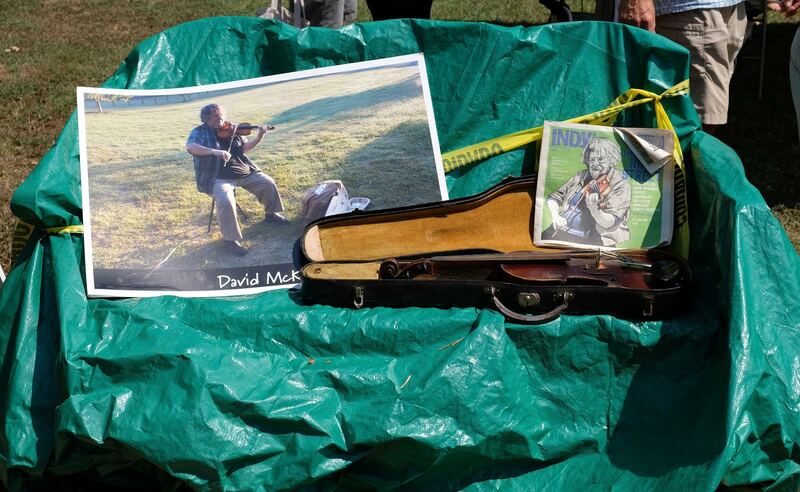 His many friends in Durham decided to pull together an event to honor David, to play his music and to let him know he was loved. The event was set for Sunday, January 15 at the Blue Note Grill in Durham. Musician friends Rebecca Newton and Pattie LeSueur posted an invite on the Blue Note’s website: “Pattie LeSueur and I want to have a few hours of great music for him, and Bill and Andrea graciously gave us The Blue Note Grill on Jan 15th. This may well be the last time David gets out to hear live music. We hope MANY folks will be involved in this tribute to him. When Sunday came, over 200 of David’s friends showed up to celebrate David. The three-hour event was live-streamed to David’s room in the long-term care facility in hopes that he would be able to watch. The friendship, love and joy that poured forth that night were inspiring. Pattie LeSueur called out the love of the group to David, and then she and Jack LeSueur played a song they had sung with David when the three of them formed the group “Triangle” back in the 1970s. Pattie and Jack Le Sueur, accompanied by Mike Foster. Written by Carlene Carter . Video by Bill Erwin of CelebrationVideos.com. Another song featured that night was David’s “Mecklenburg Waltz.” David at one point said he was going to write a waltz for every one of North Carolina’s 100 counties. If this one is any indication, I sure wish we’d had the other 99. Here is David playing the violin on the waltz, in 2011. Everyone there found it such a moving and meaningful event. As has been the case for me with other before, I knew David was going to die soon, but I still felt shocked. Words fail about moments like these. In his life David said so much with his music, and in death he left us a song he’d authored and recorded in memory of the death of his own father, “Last Call.” It’s exactly the right song for those of us who knew and loved David. David McKnight, Piano, Violin, Viola; Bill Cleaver; Joe Swenson Bass. Written by David McKnight. Last call, with its definitive ending. But his friends were not ready to let David go. After the shock of David’s death wore off, the discussion began of a memorial to David, with lots of ideas. 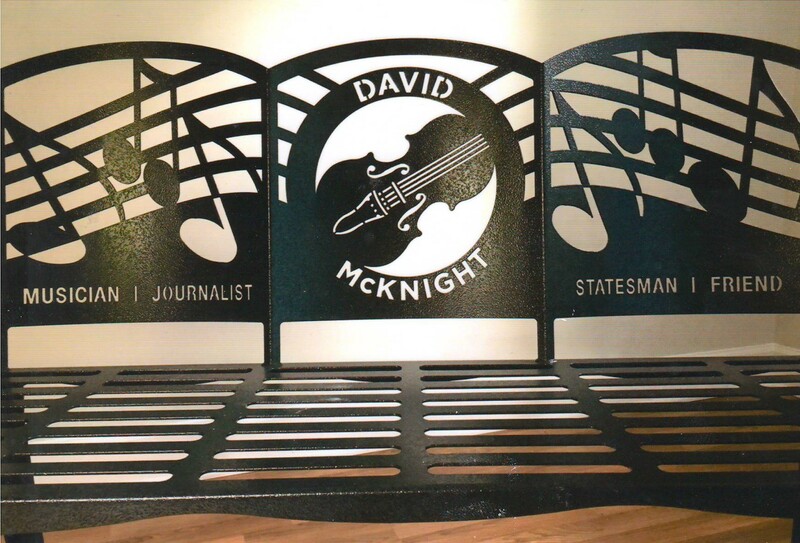 Ultimately it was decided that a bench would be placed at the edge of the Durham Farmer’s Market, right where David played his music. Brother Pete worked tirelessly to make the idea a reality. He was instrumental in raising the money for the bench and getting it designed and fabricated and to Durham. The tribute concert for David raised over $2,000. Pete and Bill Yaeger and others went to the Farmer’s Market to ask people to tell their stories about David and to seek funds for the bench. Family and friends gave gifts, and the City of Durham cooperated to make the memorial a reality. Many people came to honor and give thanks for David. After David’s death, stories about him – tributes really – ran in Indy Week, The Charlotte Observer, The Durham Herald, and Duke Magazine. Reading the latter tribute I realized a mistake I’d made in my first post. David did go back and graduate from Duke, in 1974. I don’t think he ever told me that. I have one more story to tell, about the day after Christmas, 2016. The last time I saw David was that morning. David was sitting on the bed side talking with his friend Bill Yaeger, and his face lit up when I came in. He knew who I was, but he had trouble calling out my name. “I was just telling Bill about the election results in two nearby counties where Hillary had such a big victory. And I was saying that if the Democrats had just been able to….” The thought that had started out clearly became impossible to follow. The cancer was doing its horrible work on his brain. I sat in my car and cried. Later that same day after Christmas, David’s friend and long-time musical partner Bruce Emery (together they created three CD’s) came to visit David. Here is Bruce’s story. David McKnight, mandolin, and Bruce Emery, guitar. Recorded at PruittHealth – Durham, December 26, 2016. In my previous post I questioned whether David’s friendships met Aristotle’s idea of a complete friendship, given David’s character flaws. I concluded that in asking for perfect virtue/excellence for those in a complete friendship, Aristotle has gone beyond what observation shows, and he has set too high a standard. None of us are perfect in our traits. For example, me. When David voiced ideas about moving back to Charlotte, I did not explore that further with him, not being willing to imagine what it would be like for me if David were living here. His last email to me, on November 4, 2016, focused on his ideas about moving back to Charlotte. I never encouraged him in that idea. Nor did I travel enough to Durham to visit him. And it was difficult to be friends on a daily basis with David. His paranoia, his refusal to accept medical help, his fierce and sometimes seemingly irrational independence, his lack of personal hygiene, and other traits made it a challenge. 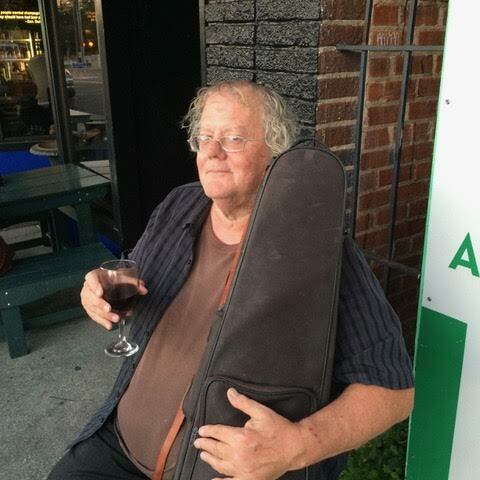 David kept putting off applying for Social Security, yet it did not seem to occur to him that friends were supplementing his busking income so he could have food and shelter. As a house guest David paid little attention to cleanliness. He ate an enormous amount of food, understandable since he might not know when he’d have his next meal, but he was helpless about preparing meals or cleaning up afterwards. When I look at friendships I’ve known and observed in my life, I feel an overwhelming admiration for both David and his friends. When I think of the type of thing a friendship is and what it can be, I am convinced that his were complete friendships. Who could imagine more than what David’s friends gave to him, and what David gave to his friends? David was a friend to all those people and to me. He gave of himself joyfully, and people gave to him willingly. While certainly they must also have felt some sense of obligation, friends who visited him in the hospital wanted to be there with David and for David. Another statement from Aristotle rings true for me now: “friendship is not only necessary but also noble; for we praise those who love their friends, and it is thought to be a fine thing to have many friends; and again we think it is the same people that are good people and are friends.” I am inspired by those many good friends of David, by their and David’s nobility. They are indeed friends and good people. You could give David the name of any city or town in North Carolina, and David could tell you the corresponding country. I began these three posts on friendship and David McKnight by asking whether his life was a tragedy. I wasn’t with David daily like his friends and family. I didn’t know the daily heartbreak of dealing with his mental challenges. I did know the young and beautiful David, and I saw his world come tumbling down, bit by bit. When I think of what might have been for David, without his mental issues, without the cancer, his life is tragic. But when I think of all the lives that David touched for the better, of the over 200 friends and musicians who turned out for a benefit and tribute to him near the end of his life, of all the people he enjoyed and knew were his friends, of the joy he brought to his friends, when I think of the beautiful music he played and recorded all these years, even when homeless, I think not just of tragedy but of overcoming, of triumph, of transcendence, of redemption, of a small world of people brought together by music, stories, laughter and friendship. And I think of someone who in many ways lived life on his own terms, despite his limitations. We all live lives within our limitations; most of ours just aren’t as readily visible as David’s. David, you were not only gifted, but you gave us irreplaceable gifts. Thanks for it all, David. I still miss you. We all do. Some say David isn’t totally gone. Some say he is back in Texas again, or somewhere else, thinking about coming back to Carolina. Listen to his voice and his violin here, and you will know that his spirit lives in his music. There are several options: YouTube, I-Tunes, Amazon music, and CD’s. For the online sources, search for “Cleaver Smith Swenson” to pull up both the earlier album “Back Home Again” and also the later album when the group had become Cleaver Smith Swenson & McKnight, “Changin’ My Mind.” I will list below specific songs by David. You can also order these CD’s from Robert Smith, robertdsmith@mindspring.com . Bruce Emery and David McKnight have 3 CD’s, of which the first is Christmas music and others familiar tunes: “All is Calm, All is Bright”; “Night and Day”; and “Windy and Warm.” You can order from Bruce, bruceemery@mindspring.com. I recommend all five of these albums. Aristotle, Nichomachean Ethics, Book 8, chapter 1, W.D. Ross translation (The Internet Classics Archive, http://classics.mit.edu/Aristotle/nicomachaen.html ), with minor changes by Frederick. Bill Pope, unpublished memories about David McKnight, 2017. Aristotle, Nichomachean Ethics, Book 8, chapter 1, translated and notes by C.D.C. Reeve (Indianapolis: Hackett Publishing, 2014. Durham Herald-Sun, Jan. 21, 2017. Aristotle, Nichomachean Ethics, Book 8, chapter 1, Ross translation. Wow ! What a wonderful tribute compiled by a great friend to David and to many of us! Thanks so much, Cynthia! And thanks for your friendship over these many years. Well told. I too feel like I should have done more along the way and I will continue to think of and miss David. I often mention David when I talk with Bill Pope. “What would David say about this?”, etc. Thanks for your comment, Robert. And thanks so much for all your help which helped me know more about David’s story. I like knowing that you still talk with Bill Pope about David. You and Swenson and Cleaver made some simply wonderful music with David, and I know how very much that must have meant to him. Norris, your tribute to David and to friendship was beautiful and honest and It touched my heart in so many ways. The description of the feelings you had that you “never encouraged him” in his idea about moving back to Charlotte and you had not traveled “enough” to Durham to visit him brought out similar regrets I had after his death. Our high school class was so large that there were many people I never got to know outside the classroom. David was one of those classmates. At the reunion I found myself engaged with him in a wonderful conversation where I found him to be witty and charming and so obviously intelligent. I was totally unaware of the hard life he had lived for so much of his adult life. Soon after the Reunion, I was one of the recipients of the email you mention that he had sent out to some classmates thanking us for the “refreshment and healing” he felt having been in our collective “enchanting and rejuvenating company once again”. I remember reading his email and thinking that if he did move back to Charlotte it would be nice to forge a new friendship with him. When I saw the emails and Facebook posts about his terminal brain cancer and his rapid decline and death, I felt regret that I had not done more to be one of David’s close friends you described, particularly in his last few months. After reading your tribute to him, I realize even more how much I lost by not doing more to get to know him. Kris Kristofferson in his song Me and Bobby McGee wrote “Freedom’s just another word for nothin’ left to lose” and if that is true, David might have lived with more freedom than any of his friends. While that might help soothe some of the sadness of his life and death, it does not ease the pangs of regret that comes with lost opportunities. May we all make an extra effort to be a friend when we feel those urges to do so. Rebecca, I am so glad that my writing on David touched your heart. He touched mine, too, so much so that it took me getting a year away from his death before I could write this. Your writing is beautiful and thought-provoking. I loved hearing that at the reunion you found yourself “in a wonderful conversation where I found him to be witty and charming and so obviously intelligent.” And it’s wonderful that you had no idea about his hard life — he wanted so much for his classmates not to judge him for that. And thanks for summing up the lesson for many of us — to make extra efforts for our friends. Thanks so much for your insightful email about this post, Hope. I really like your “I laughed” and “I cried” sentence, as it mirrored much of what I thought about my time with David. I’m glad to know you liked this series the best, and of those that your favorite was the most recent post. I like the line you quoted. too: I was thinking of the issue of freedom and determinism off and on while writing this piece, and that line is related, of course. Reading Norris’s last episode about David, these were my thoughts. I was touched by the exploration of both poverty and friendship. Here was a man who was steeped in poverty and the mental illness that force many people into poverty, yet is surrounded by friends who enjoy his company. Where does that put him in life, society, evolution, philosophical endeavors? It puts me more in touch with myself – my True Self. The music is who David really is. Is it who we all are, maybe we just have not found it. I remember what a talented musician David was and how much it meant to him. Where does Music fit into our search for True Self and Happiness? Just listen to David’s licks on the pieces here and you will understand David. It was a pleasure to read this and remember all the old friends that David and I shared, some whom we have since lost, Nancy Gilliard is the biggest loss to me in the group mentioned here. We will all be going away in the next few years. That is life. Norris is the best friend a man or woman could have. His writing will keep David and David’s music alive for years to come. Thanks to a great friend. Let’s all stay close and keep David in our memories. Norris will be the touchstone. Your insightful comments mean a great deal to me, and they have provoked all sorts of thoughts in my mind about our true self,music, and all of our old friends, whom as you mention some we have lost. For me, too, Nancy is the biggest loss of those friends. I will disagree with you on only one thing: YOU are the greatest friend anyone could have. What an amazing and heartbreaking story. So much talent and it feels as if the world was cheated out of the young man that took Garinger by storm. But the gifts that he left and the people that he touched and loved are a legacy we could all strive to obtain. Norris, you have beautifully captured David’s life and have rendered a tribute which touches all who read it. You have kept David alive.